Sunday morning is always crunch time for a preacher. Every preacher has his or her routine. For me, it means an early cup of coffee. No breakfast, because I don't want my stomach churning food before I preach. I review my notes, although I preach without notes or a manuscript. I mumble and rehearse a few key phrases. I highlight the transitional moves. Then I put my notes away and never look at them again. Perhaps I will take a bicycle ride along the canal, or go on a run. The sermon whirs through my head. But what if it's Sunday morning and you're in the People's Republic of China? That's what I was wondering when my wife accepted a position at Shanghai American School eight years ago. As a writer and editor of a religious journal in the U.S., I planned to continue my work. But I wasn't sure how I'd practice my faith, let alone preach it. Truth is, I didn't know too much about the state of Christianity in China. On arriving at Pudong International Airport, I thought that perhaps I had to check my religion at immigration and passport control. That's why I was astonished to discover, just a couple blocks away from our apartment, a huge church campus with a cross perched prominently atop the roof. It was home to a large Chinese congregation, and an English-speaking service was held Sundays at 3 p.m. Soon I was invited to preach at this church from time to time, and now preach regularly as the Associate Minister of Trinity Congregation, one of three services of Abundant Grace International Fellowship. I was also surprised to learn that my Sunday morning routine would not change. The coffee, the bike riding, the pre-sermon mumbling -- all the same. So am I free to worship as I please in China? Do the Chinese have these same freedoms? Yes and no. Yes and no. I had to register my passport with the Shanghai Religious Affairs bureau. They like to know who the preachers are. But the only censor to whom I submit my manuscript is still my wife, not the much more lenient Communist Party censors. As in the U.S., I can preach on any topic as long as that topic is not Taiwan or Tibet. Anything else from Genesis to Revelation and texts in between is not a problem. Chinese nationals are not permitted to attend our services, but they are free to worship at one of their own churches led by a Chinese pastor. However, if the church is not registered with the government as a member of the state-sanctioned "Three-Self Patriotic Church," (self-governing, self-propagating and self-supporting), it is an illegal church and may, but not always, be shut down by the government. The threat of government interference has done nothing to impede the growth of Christianity in China. Some observers believe that by 2030, China will be home to more Christians than any other nation in the world. Although the number of Christians in China is hard to determine, it's likely more than 100 million. 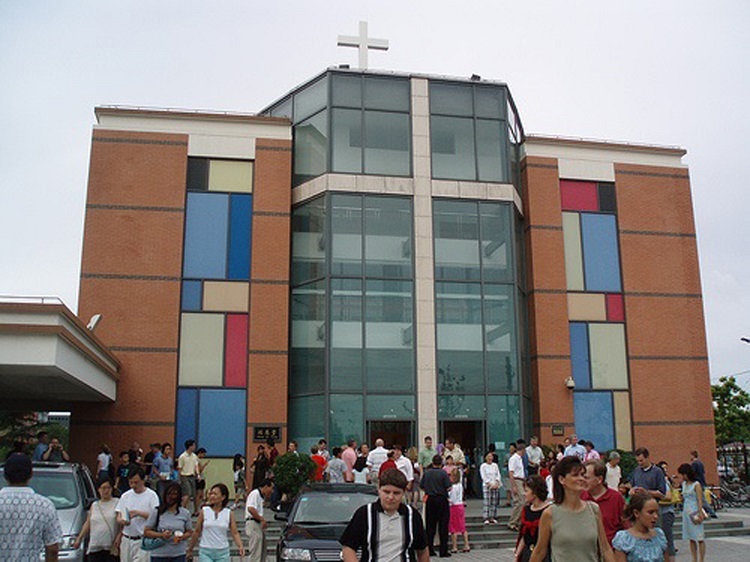 On any given Sunday, more Christians are worshiping in China than in all of Europe. I traveled recently to Yunnan province and visited the western district of Fugong where 60 percent of the citizens are Christians. One slight difference between preaching in the U.S. and Shanghai, is that my congregation here is a congregation of expatriates. A striking difference, however, is that the congregation is nondenominational. If you're one of 200,000 expats in Shanghai, and you're looking for a Methodist church, you won't find it. No denominations in China. No Lutheran church. No Presbyterian or Baptist churches. As far as the government is concerned, Christianity exists in two formats: Catholic or Protestant. When asked about his religious experience in China, Dave Poppell, a businessman in Shanghai for a U.S. company, says that he's now a "Southern-Roman-Dutch Reformed-Presbyterian-Quaker-Baptist, who celebrates Passover." Government officials sometimes are puzzled when expatriate "Protestant" groups ask for permission to establish another church in the same city. "You already have a church!" Meaning, a Protestant church is already established. Go to that church. That's why expat Protestant churches in China are denominationally mixed. It's truly an ecumenical experience. The doctrinal nit-picking is set aside. Babies are sprinkled and adults are dunked, if that's what they prefer. Those who celebrate the Eucharist every week worship with those who don't even call it the Eucharist and observe it only once a month. Hand-waving, "light-bulb-changing" Pentecostals worship side by side with hands-in-pockets "mainliners." Most expats agree that this is a good thing. We are forced to get along. We put aside differences, and it helps us to focus on the experience of worship and the common elements that unite us as Christians. And it helps to connect us with home. I asked the Reverend Peter MacInnis about this. MacInnis, former General Manager of the Amity Printing House in Nanjing, the world's largest publisher of Bibles, was born and raised in Taiwan and has lived in China for the past 27 years. He said, "Moving overseas, especially to China, is a huge disruption for these families, and finding a large community of believers gives them a little slice of 'home.' It helps to ground them while adjusting to life in a foreign culture far from the familiar. Many of them are almost jumping with excitement to find a church and it doesn't matter if the 'brand' is different from the one back home." So, today, I am ready to preach -- not to the Chinese, but my fellow expatriates. We rent space from a large Chinese congregation. John Ideker has decorated the altar with candles and flowers. The expats are gathering. Kids are running to Sunday school. Dr. Jonathan Borden, principal of the high school at Shanghai American School, is reading the Scripture. Some 120-150 will show up for the 11:30 a.m. service, 400-600 for the 3 p.m. service. Only half will be from the U.S., Canada, Europe or Australia. The other half will consist of Christians from the Philippines, Thailand, Singapore or Africa. But they expect to hear the Word. And that's what they get.